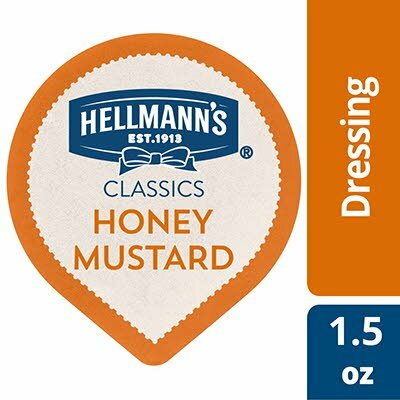 With its flavorful balance of sweet and spice, Hellmann's Classics Honey Mustard Salad Dressing Dip Cups offer a mellow taste that will satisfy even your most discerning patrons. This gluten-free honey mustard dipping sauce and dressing is made with real, simple ingredients that your guests can trust--including real honey--and contains no high fructose corn syrup or artificial flavors. With grainy mustard seeds, this honey mustard dip sauce has a premium look and adds pleasant texture to salads and other dishes. Whether paired with a house salad, served as a tasty dip, or used as a condiment, this dressing is sure to leave your guests with a positive impression. And since it comes in a convenient 1.5-ounce dipping cup, it allows guests to self-serve and control their own portions. Creamy dressing mouthfeel with sweet Dijon mustard/honey notes apparent.